Cutest box art ever? Just look at the monkey. Remember Zoo Keeper? Remember how many hours you lost to it? Want to play it again in 3D? Eager fans crying out "yes!" 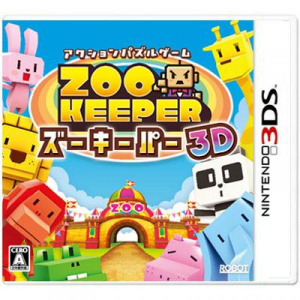 to all three questions, rejoice: Zoo Keeper is on the way to 3DS in early 2012. Siliconera spotted a listing at the Japanese website of retailer HMV, pitching the match-three-in-3D game for a 26th January release, complete with a quest mode and online play. We'll keep you posted if the game stages a break from its Japan-only confines. Why is this a retail game?! Who's going to spend 30-45 bucks on this? @1 because its awesome, and it's good to support the guys that make it. Have the iPad version, will buy this in a heartbeat. Love Zookeeper. I´d buy this kind of thing only as cheap downloadable, not gonna pay 50€. i liked this on ds until i couldnt beat my wifes score. @daznsaz I know what you mean; my wife's scores are pretty much unbeatable as well. I still have a lot of love for Zoo Keeper though. It was one of the first DS games I ever bought. Zoo Keeper was my first DS game, I'll definitely be picking this up. @mr reece yea its hard to put down when your into it. I'm a zoo keeper legend mwahahaha! I might buy this but not at full price. Can't wait, loved the original. Huh. This is a unexpected blast from the relatively recent past. love it loads its just so additive!! I never played the original Zookeeper. I always loved the art style. I just never got around to picking it up. I think that I will just get this one instead. Zoo Keeper was my second DS game. I'll most likely get this, but I'm hoping it's a little cheaper then $40. I have Zoo Kepper for the DS and while it's decent i don't have the fondest memories of it. WIll be interesting to see if this one has enough content to warrant a retail release. I abe Zoo Keeper DS too. I believe this game offers little incentve to upgrade to 3d graphics. Some games, like Tetris; the 3D effect offers very little to the core gameplay except to distract your eyeballs. I believe Zookeeper will be the same way. I may buy it at some point, but I'm not paying $40 for what should be a $20 game. I cannot play Tetris Axis in 3D, for instance. Zelda, Starfox, and Mario 3D Land, on the other hand, are visually breathtaking.